Some basic glossary terms snatched from this. Acoustic Beam . High power, very low frequency beam emitted from weaponry under development. Envisioned to be a piston-driven or detonation-driven pulser which forces compressed air into tubes to generate a low frequency wave [543,546]. Acoustic, Blast Wave, Projector. Energy generation from a pulsed laser that will project a hot, high pressure plasma in the air in front of a target. It creates a blast wave with variable but controlled effects on hardware and troops . Acoustic Bullets . High power, very low frequency waves emitted from one to two meter antenna dishes. Results in blunt object trauma from waves generated in front of the target. Effects range from discomfort to death. A Russian device that can propel a 10-hertz sonic bullet the size of a baseball hundreds of yards is thought to exist. Proposed fixed site defense [16,113,212,543]. Also known as sonic bullets. Acoustic, Curdler Unit . A device which is plugged into an HPS-1 sound system to produce a shrill shrieking, blatting noise. It is used to irritate and disperse rioters and had a decibel range just below that of the danger level to the human ear. It is used in night operations to produce a “voodoo” effect and effectively breaks up chanting, singing and clapping [2:279- 280,82:184,84,529]. Acoustic, Deference Tones . Devices which can project a voice or other sound to a particular location. The resulting sound can only be heard at that location [176:86]. Acoustic, Doppler Effect Alarm . Any movement in the area between a transmitter and a receiver causes a slight variation in the sound pattern received. By measuring this variation an alarm system can be made to be activated [23:204]. Acoustic, High Intensity Sound . Loud music was used by American forces to drive Manual Norriega from the Vatican Embassy in Panama in 1990. Also known as polysound [354:45]. Acoustic, HPS-1 Sound System . A 350 watt sound system with an audible voice range of 2 1/2 miles. Used by the military in Indo-China and then supplied to law enforcement. First used by police forces at San Francisco State College and at Berkeley in the 1960s [2:277-279,82,84]. See also Acoustic, Curdler Unit. Acoustic, Infrasound . Very low- frequency sound which can travel long distances and easily penetrate most buildings and vehicles. Transmission of long wavelength sound creates biophysical effects; nausea, loss of bowels, disorientation, vomiting, potential internal organ damage or death may occur. Superior to ultrasound because it is “in band” meaning that its does not lose its properties when it changes mediums such as from air to tissue. By 1972 an infrasound generator had been built in France which generated waves at 7 hertz. When activated it made the people in range sick for hours [23,302,546]. Acoustic, Squawk Box . Crowd dispersal weapon field tested by the British Army in Ireland in 1973. This directional device emits two ultrasonic frequencies which when mixed in the human ear become intolerable. It produces giddiness, nausea or fainting. The beam is so small that is can be directed at specific individuals in a riot situation [451,452,504]. Acoustic, Teleshot . Cartridge projecting a powerful sonic device delivered by a 12-gauge shotgun. Experimental use in 1972 . Acoustic, Ultrasound. A very high frequency sound whose wavelength is “out of band” making it less effective than infrasound because it losses its properties when it changes mediums. Example, from air to human tissue. Like infrasound a lot of power is required to generate these waves which create biophysical effects. See also Acoustic, Infrasound. Another device I just learned about is called the Inferno. Its interesting how the development of alot of these devices seems to be a response to piracy on the high seas. Thanks to James Trafford for this link. The Thunder Blaster is being manufactured by a company called Armytec so I think its safe to assume that it won’t just be used for scaring birds. The president of Armytec is Shlomo Tabak, a former Israeli military special operations officer, whose command positions included anti-terror training and oversight of Special Forces development programs. The technology deployed is called Pulse Detonation Technology. One of its inventors Bezelel Liberman noted “Because we can control the power of the shock waves, we found we can use the process for many applications, including military, police and peripheral security missions,”. . .”It’s much safer, cheaper and in many cases [more] politically acceptable than other explosive materials.” Ephraim Sneh, a former Israeli defense minister, said more effort should be put into deploying such systems. “Use of nonlethal means saves lives and helps prevent violent deterioration of riots and mass protests,” he said. Sneh said the Thunder Generator is a good example of a safe, inexpensive and simple alternative to the use of lethal force. Apparently ArmyTec is offering Thunder Generator in fixed or vehicle-mounted installations, operated manually or via remote control. The firm’s proposed multibarrel design simulates a battlefield-like experience, while a three-axis moving barrel allows precise targeting of areas within a wide perimeter. I would expect however, as it the case with the current fashion for non-lethal weaponry, that such messy devices would not replace lethal weapons but be merely added to them. Don’t believe the hype! Kodwo Eshun’s review of Sonic Warfare from last months ‘The Wire’. Strange how he talks about ‘the’ unsound. I’ve never used the term with a ‘the’ before. Puts a slightly different complexion on things. Thanks to Melissa Bradshaw for this engaged review of Sonic Warfare. She bravely, and probably crazily, attempts to hear Sonic Warfare through the Hyperdub 5 compilation and vice versa. This is not something I’d generally recommend, preferring the inconsistencies between the book and the label, their divergences to their convergences, but its natural people will focus on the resonances. A kind review of my book here by Geeta Dayal whose own book can be found here . Also thanks to Kodwo Eshun for the review in this months Wire magazine. Interesting interview with German philosopher Peter Sloterdijk in Frieze mag from last year. Reminds me of Virilio before he got religious. 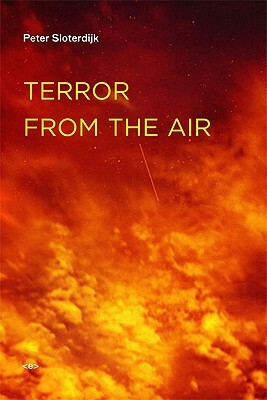 Reading his ‘Terror from the Air’, I’m constantly reminded of Brian Eno’s notion of music as perfume, and that little black Throbbing Gristle Buddha Box I bought a month ago that is like a little toxic air conditioner, oozing bad vibes, staining the ambience. Anyway, I can’t wait to read Peter Sloterdijk Spheres trilogy when it eventually gets translated, in which he develops his theory of bubbles, globes and foams.